For readers familiar with the phrase ‘after the Lord Mayor’s show’, Tuesday night’s 2-1 Reserve defeat away to Fulham can be summed up quite nicely in such a manner. If you’re not au fait, a wet night in Merton for Chelsea’s second string came as something of an anticlimax to Monday night’s breathtaking youth team performance. Perhaps surprisingly, goalkeeper Sam Walker played in both fixtures. With Jan Sebek travelling with the first team squad for the Portsmouth match tomorrow due to Rhys Taylor’s injury, and Niclas Heimann looking for a new club for next season, the decision was taken to give the impressive youth team stopper his debut in Steve Holland’s reserve side. Also playing for the second consecutive night was Milan Lalkovic, who played an hour of the Youth Cup Semi Final. With this being the club’s third game in as many days across all levels, numbers were thin, and were made even thinner by the first team’s injury crisis. This amounted to Nikki Ahamed playing in an unfamiliar left-back role, and rare opportunities for Nana Ofori-Twumasi and Daniel Philliskirk to start. Alongside Kenny Strickland at centre-back was captain Sam Hutchinson, playing for the first time in five months after the latest in a series of knee problems. The rest of the team saw usual stalwarts Bridcutt, Mellis, Kakuta and Borini take to the field, although the subs bench left experience to be desired, with four first year scholars alongside backup goalkeeper Aldi Haxhia. Fulham, as is standard at this level, came in with a mix of youth and experience, giving playing time to internationals Erik Nevland, Kagiso Dikgacoi and Frederik Stoor, but also to young defenders Matthew Briggs and Cheikh Toure and impressive Dutch forward Danny Hoesen, who would be the peripheral figure he tends to be against the Blues. In front of a surprisingly busy crowd at a Motspur Park pitch shrouded in darkness and rain, the action got underway with the Cottagers pressing high up the pitch, forcing early errors from a nervous visiting back four. Indeed, they were to have the first goalmouth action, as Robert Milsom’s well-struck drive from the edge of the area drew a sharp stop away to Walker’s left, before a rebound effort skidded wide. As the rain picked up speed and Chelsea toiled with poor control of a wet ball, Fulham grew in stature and ensured that the young Chelsea goalkeeper’s first night at this level would be a busy one. He was again impressive in keeping out a good shot from Hoesen, but from the resulting corner he was powerless to prevent the striker turning the ball home from close range. It was his fourth goal against the visitors at youth and reserve level, and put his side ahead after just sixteen minutes. Billy McKinlay’s side pressed with a high tempo and continued to force mistakes, particularly from Ahamed, who was finding the going tough out of position. Former Blues schoolboy Neil Etheridge was having a quiet night in the home goal, it taking until midway through the first half for Chelsea to really threaten, but Jacob Mellis’ shot was high and didn’t worry the Filipino international. Whilst they toiled, Fulham looked clinical, and doubled their lead before the half hour. Hoesen was once more an integral figure, coming inside and firing a powerful shot across the face of goal. Walker looked set to deal with it but Nevland arrived unmarked to blast home from point blank range. Chelsea were simply second best in every area of the pitch, and were lacking a commitment and enthusiasm which somewhat mirrored the first team’s approach at Blackburn on Sunday. Heads had dropped and blue shirts were hiding behind white when options were needed in possession. Borini was working a lone furrow up front and not getting much joy out of either centre-back, both of whom had the physical edge, and instead had to resort to shooting from distance. The results weren’t pretty, sailing over the crossbar and into the car park on one occasion. At the other end, Dikgacoi chanced his arm from the halfway line, and whilst Walker had it covered, it wasn’t too far away from being a worry. In first half stoppage time a Kakuta free kick from just under 30 yards out went close enough to earn applause but not quite enough to fluster Etheridge, and it was a damning indictment on Chelsea’s performance that it was their moment of the half. Holland isn’t typically a man for stern words, so one imagines his team talk was more encouraging and confidence-building than teacup-throwing, but to his credit, the attitude changed in the second half, and was helped by more of a physical presence. Rohan Ince entered the fray for Hutchinson, who had come through his 45 scheduled minutes unscathed, and went straight into midfield, with Bridcutt taking the captaincy and going to centre-back. Admittedly, it took a while for the Blues to assert themselves, and Walker was once more required to keep Hoesen at bay, but Ince’s added size and long stride in the middle of the pitch gave Chelsea a transition their game had lacked. With the wet surface not conducive to spreading the ball out to the wingers, a different approach was adopted, and began to reap reward. The ball still found its way to the flanks, but from further up the pitch and into feet rather than into space. It allowed Lalkovic to get down the right and test out young Alex Smith, who struggled against the Slovakian. Three or four times in a short spell, Lalkovic produced a threatening cross, but with only Borini to aim for in a sea of giants, they were wasted. Unfortunately, Lalkovic was withdrawn after an hour, playing 120 minutes in the space of 24 hours, and was replaced by George Saville, who was making his reserve debut. Bobby Devyne was doing similar, coming on for Kakuta, and it meant a reshuffle in personnel. Mellis moved onto the right wing, with Devyne on the left, and Saville taking up a central midfield role, initially more advanced than Philliskirk, but the trio moved with fluidity and discipline. Saville’s left foot added balance to the centre of the pitch, and Chelsea seized the initiative. They lacked creativity in the final third, but had at last assrted themselves on proceedings. Walker was still busier than Etheridge, making a low stop from sub Michael Uwezu, who had entered the fray along with Courtney Harris. Harris’ arrival was a strange one, with Fulham first team manager Roy Hodgson demanding McKinlay make the change from his vantage point in the stands. With time running out, the game was rolling towards a 2-0 final score, but Chelsea set up a grandstand finish with ten minutes left on the clock. Ahamed went to the byline and stood up a cross to the far post. Philliskirk arrived on the scene at the opportune moment and headed in from a yard out to reduce the deficit to one and offer a lifeline. With the ball firmly in their court now, the visitors knew they would have at least one more chance to get a second goal, and when it came, it was a golden one. Mellis played a slide-rule ball down the channel and Borini beat the offside trap. With just Etheridge to beat, the Italian set himself but was unable to convert the gilt-edged opportunity, and in truth, there was never a feeling of confidence in him putting it away, such had been his evening. Ahamed and Ince had thrashed efforts sail over in desperation, and Fulham were able to come away with a 2-1 win which they probably deserved on the balance of play. 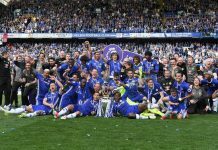 For Chelsea, it was a mixed bag for a mixed team. Walker was easily his side’s man of the match, whilst fellow youth teamers Lalkovic, Ince and Saville also turned in good performances. In contrast, reserve regulars Ofori-Twumasi, Phillskirk and Kakuta had disappointing evenings, whilst Mellis and Bridcutt had solid outings. There was some individual promise, once more from the younger side of the club, but it took the team too long to get going. As a result, they were never truly able to control the game, and paid for it.